We all know that we have a bit of an energy problem. Traditional methods of creating power, like fossil fuels, cause vast amounts of air pollution and habitat destruction; however, there are a number of new energy sources under development, and there are a number of nations working on this issue. Case in point, Denmark is proving itself to be a benchmark for sustainable energy ,as it sets yet another world record. As of 2015, 42.1% of the country’s overall electricity is being drawn from wind energy—a significant leap from its previous record, 39.1%, which Denmark set back in 2014. Chalking it up to a windier year, the country asserts that this is what ultimately led to the record production of energy produced by their wind turbines. Notably, the nation currently holds the highest ratio of wind energy production anywhere in the world. This is also not the only record that Denmark has set in this particular field. Danish windmills generated 140% of the country’s electricity in a single day as well. Denmark also holds the distinction for having one of the most sustainable energy production methods via wind turbines. 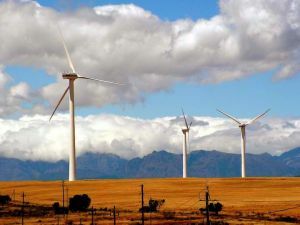 In 2005, the country was already using 18% of energy produced by wind, which grew to 22% in 2010. Denmark also sells wind power to neighboring countries, such as Germany, Sweden and Norway; similarly, they purchase solar power, hyrdo power, and nuclear power. This milestone comes after recent news of other countries making headway into use of renewable energy as well. Costa Rica, for instance, just made headlines after it was reported that 99% of their electricity now comes from renewable energy; similar to Uruguay, who reached 95% use of clean energy. Recently, one of the Canary Islands became the first in the world to be powered entirely by wind and water. The feat is quite a notable accomplishment though, full disclosure, the island only has some 10,000 residents to support. Moving to alternative forms of energy will be far more difficult for larger nations, particularly large Western nations that have an economic infrastructure that is based on fossil fuels. However, this recent news shows that there is reason to hope that such feats will be seen very soon.